Do you have an iPad? And you want to install WhatsApp on it so that you can hang out with your friends online all the time? 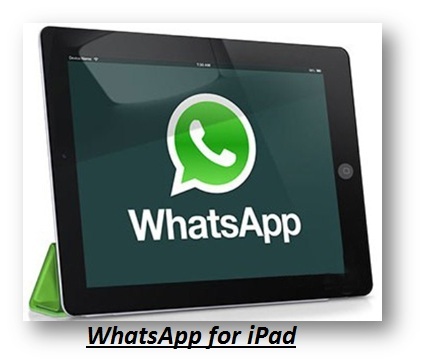 Today we will tell you how you can install a super quick WhatsApp on your iPad for free of cost. So far there is no WhatsApp feature on iPad and this is one of the reasons why so many people turns down to buy iPad. Unlike other Smartphone’s, WhatsApp is currently unavailable for iPad users, as the makers of WhatsApp have yet not launched it for iPad. If you think downloading WhatsApp on your iPad is a rocket science then simply follow below mentioned instructions to crack the mystery of WhatsApp on your iPad. To begin with first of all you need is an iPhone with WhatsApp being already installed on it. If you don’t have an iPhone you can borrow it from your friends, after that all you need is to sign up on whatsapp by entering your number, remember first you need to delete the already installed whatsapp from the iPhone and then re-install it and then sign up fresh. After signing up you need to install iFunBox on your iPhone so that you can manage all your apps on your iPad. The next step is to connect your iPhone to your computer and then open the iFunBox app. Here you will find User Applications, all you need is to click on it and select WhatsApp folder and then copy paste the Documents and Library folder on your computer desktop. After you are done with copy paste, next step is to simply disconnect the iPhone from your computer and then connect your iPad to your computer. Then again you have to access the iFunBox folder on your iPad and click on the User Applications and select whatsapp. Now copy the Documents and Library folder you pasted on your desktop and move it to the whatsapp folder in your iFunBox app (in the whatsapp folder). Now you are all set to use whatsapp on your iPad, disconnect your iPad from your computer and sign up on whatsapp, remember first you must delete your whatsapp account from the iPhone so that you don’t get any error message as whatsapp do not allows multiple account access on different phones.